Special discount for KRL readers at the end of this post. After a brutally hot and smoky summer, I am very much looking forward to beautiful fall bike rides! Layer, layer, layer! I went for an early morning bike ride this week dressed for summer and did not stop shivering until an hour after my ride. Learn from my mistakes and layer up! Next time, I’ll wear arm warmers, insulated gloves, a thermal headband, and maybe even a lightweight jacket to keep the wind out. The nice part about wearing cycling-specific gear is that it’s meant to be shed when you warm up midway through your ride; it’s designed to fit rolled up into your jersey’s back pockets so you don’t have to wear a bulky sweatshirt tied around your waist and worry about the sleeves getting caught in your spokes. Cycling-specific gloves are also thinner without sacrificing warmth, so that you don’t compromise function and can still feel your brakes for safe slowing and stopping, and feature padding to help minimize numbness on the bike. Many people take advantage of our six-month special financing to get geared up for the fall/winter season. Stop in or apply online today! 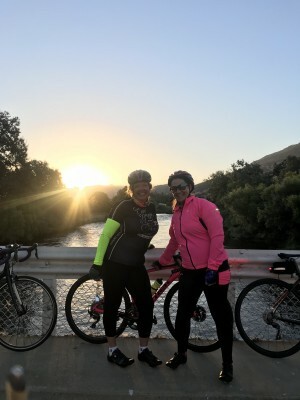 Michele and Pat on our cold morning ride earlier this week. Look how appropriately they are dressed, and how comfortable and happy they look! Ultra-bright lights are one of the best investments you can make! Be bright, be safe! Be bright, be safe! I run my headlight and taillight day and night all year long, but it’s especially important to do as the days get shorter and less bright. I suggest a light with daytime- and nighttime-specific flashing patterns to really stand out on the road. My favorite set is the Bontrager Ion Pro RT and Bontrager Flare RT. It is a huge mistake to think that just because you can see, others can see you. Make the investment in your safety and purchase a good, quality, ultra-bright, all-weather light set and make yourself as visible as possible out there! Plan ahead! Make sure to do some kind of flat prevention with your bicycle tubes. Whether it’s thick thorn-resistant tubes with Slime, or regular tubes with sealant, you’ll want to make sure you have some kind of protection against flats before you ride. This is true all year long, but especially after a long, hot summer. The goatheads are all dried up and have popped all over the road, which can lead to a frustrating ride if you’re running standard tubes alone in your bike. Be prepared! Even with flat prevention, you should still always ride with a way to fix a flat just in case. I carry two spare tubes, an inflator, two Co2 cartridges, two tire levers, and a tire boot with me on every ride. I much prefer riding my bike to walking my bike! Be proactive! If it’s been a few months since you added sealant to your tubes, check them to make sure it hasn’t hardened up into a gummy ball. I also strongly recommend basic maintenance service each season. Bring your bike in and let one of our expert mechanics check it over for you. They’ll inspect it for wear and tear (e.g., bald tires, worn brake pads, stretched chain) and help you stay on top of things to keep you safe out there. Checkovers are always free, so bring it in or services today! John on our monthly Breakfast Ride last fall. Join us October 21 for a fun, social ride to breakfast at Blossom Trail Cafe! Riding a bike does wonders for our physical and emotional health. It helps keep our hearts healthy and strong, decreases depression and anxiety, forces you to be present, helps melt stress away, and gives our body the fresh air and sensory stimulation it craves. And when you ride with a group, it provides the social connection often lacking in our fast-paced lives. 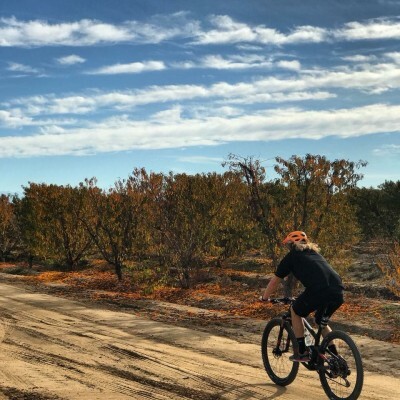 If the heat and smoke combination kept you inside all summer long, now is the perfect time to hop back on your bike and get in the habit of riding again. Hopefully, I’ll see you on the road! 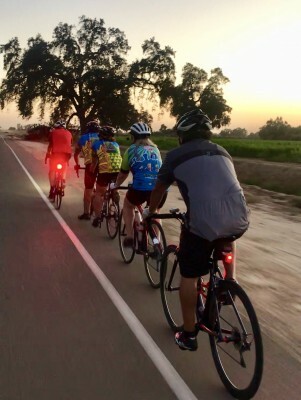 Check out SunnysideBicycles.com for a schedule of our rides, or join our Strava Club if you’re looking for like-minded people to ride with! Mention this article for 20% off any regular-price cool-weather apparel item! Offer expires October 31, 2018. 6105 E. Kings Canyon Rd.